Two toddlers go on a bumpety berry hunt in this darling picture book that’s perfect for preschoolers. Award-winning author K.L. Going’s celebration of imagination, creativity, and sibling love will have readers young and old chiming in—and yearning for some yummy pie! Simone Shin is an award-winning illustrator and a graduate of Boston University and the Art Center College of Design. She began working as a freelancer illustrating for magazines and newspapers, and teaching children in the arts, eventually venturing into children’s book illustration. Her inspiration comes from her highly active young son, as well as her strong interests in music, nature, and family history. In her spare time she likes to create things with fabric and cardboard for fun—game boards, telephones, record players, violins, dollhouses, just about anything she can think of! After residing for many years in the Los Angeles area, Simone currently lives in the San Francisco Bay Area. faces are equally comforting, including some close-ups that even kids in the back row will be able to see. Two grinning children take a wagon out with a bumpety-bump, toss pebbles in a pond with a dunkety-dunk, and gather berries in a bucket with a plunkety-plunk. Inside, the berries are transformed into pies and the children go dunkety-dunk into the bath before they get in bed for stories (snuggled up in a lumpety-lump). 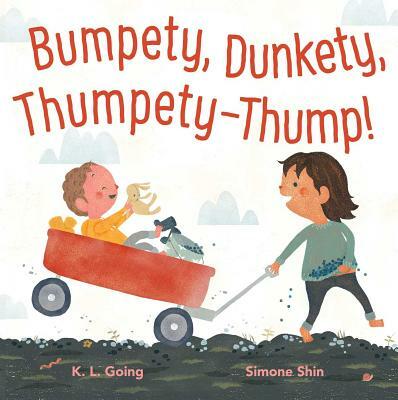 Shin’s illustrations, simple shapes with a block-print feel, evoke the sights, sounds, tastes, and textures of the text’s onomatopoetic rhyme in textured earth tones accented with pops of primary color in the kids’ red wagon and yellow rain boots. The simply drawn characters are expressive in their whole bodies, grinning as they cart berries inside and splash exuberantly in the sink and tub. The ending quiets down as the bumpety, plunkety, glunkety-glunks of play and bathtime give way to the thumpety-thump of heartbeats as the family cuddles up together for storytime. This cozy story is sure to become a bedtime staple, priming little listeners (and adult readers-aloud) for sweet dreams of summer adventures.